Living Room is the soul of the house where we meet guests, relatives, and friends. It also serves as a common room for the family members which simply means that we need to put special efforts in its design and decoration. An ornately decorated living room reveals a lot of things about the owners of the house. And in case you have just relocated to a new house, your main aim must be to win the attention of your neighbors to build your social circle which you can accomplish very easily by concentrating on various elements in your living room and making positive changes to improve its feel. Although it’s a tad difficult to think about each and every element in the room to come up with unique ideas if you cleverly employ certain changes in the room you can enhance the positive features of the room without putting in much effort. Here are some inspirational design ideas for your living room. A beautiful mirror placed above the fireplace is an inspirational way to add a striking definition to the living room. Installing a mirror opposite a window is another way to enhance the appeal of a room. You can also use wall hangings with mirror work on the main wall to infuse more light into the room. Curtains form an integral part in interior designing. Stay away from heavy or thick curtains in the living room as they prevent natural light and fresh air from coming through the windows. Invest in sheer curtains in light pastel shades and install them on the windows to allow the sunlight inside the room. The thin texture of the curtains would illuminate the windows of the room. The furniture of your living room is elemental in deciding how the room is going to look like. Invest in lightweight furniture pieces in earthy colors. Bulky furniture takes away a lot of space and makes the interiors look dull. There’s an amazing variety of compact furniture pieces in creative designs available in the stores these days. Pay attention to each of the furniture items you buy so it blends perfectly with the walls, windows, and curtains in the living room. Accent ceilings are the latest trend in living room design. These give the room a whole new look and improve the appearance of the walls. Installing beams on the ceiling is another way to make it stand out. You can experiment with lots of unique patterns and textures like leaves, flowers and other art forms for the ceilings to make them appealing. Installing a chandelier on accent ceilings helps to highlight the patterns in a unique way. Covering the walls with accent tiles is another way to give a new definition to your living room. You can opt to use the tiles on the main wall or on fixed areas in the walls to transform the ambiance of the room. Even if you plan to keep the decor of the room to the minimum, using tiles with different patterns on specific parts of the room will look the room dressed up without any need to install wall hangings or other wall pieces. 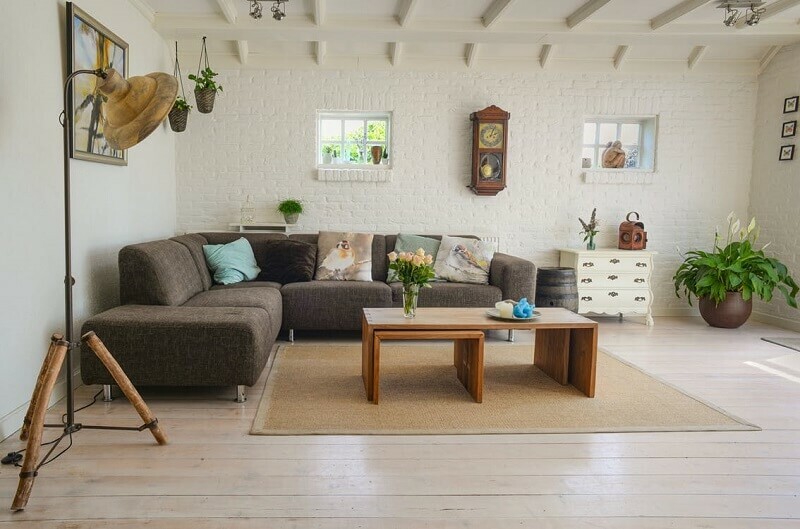 Whether you have a large or a small living room, you can opt for hanging lights according to the size of your room. Your living room lighting will create the perfect ambiance. Lanterns placed at the center of the room ceiling work wonderfully in bringing out the best features of the room. Placing the lights near the accent pieces in the living room helps draw the attention of the visitors. No accent piece can improve the feel of a living room as better as a plants do. Add some elements of nature in your living room in the form of indoor plants. There are some houseplants that purify indoor air. Invest in those plants for your living room. Hanging plant pods are another interesting option to add in your living room. These pods are grown in tiny boxes which can be hung on the walls of the room. There’s an interesting variety of miniature fruit and flower plants as well which work wonderfully in infusing positive energy in your living room.